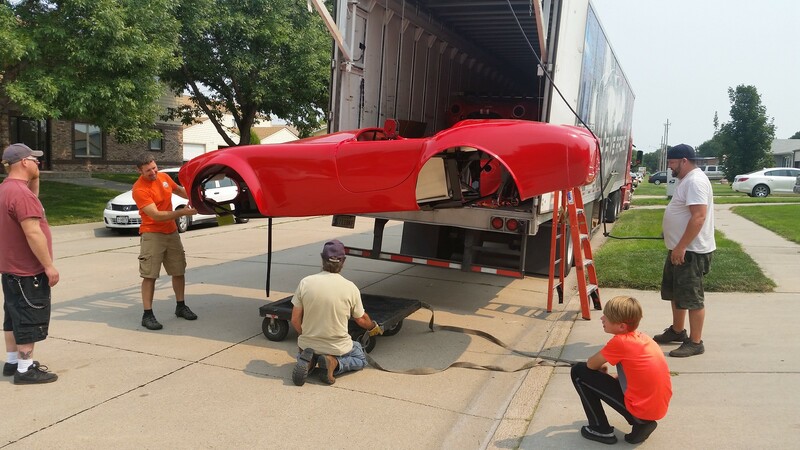 After about 30 years of dreaming of owning a Cobra I finally pulled the trigger and placed my order online during the June open house. I was planning on ordering it in September, but everything fell into place unexpectedly and I just "had" to do it. When I was about 11 years old (30 years ago) my Mom caught me on the phone with another Cobra replica manufacturer. I was trying to get some info on their car and get them to send me a brochure (this was back before internet). My mom took the phone from me and proceeded to let the sales man on the other end have it. She explained to him that I was an 11 year old boy and had no business with one of these cars. Well, that just fanned the flames and here I am 30 years later with one in my garage. My plan is to build this for an all around fun car. I'll be cruising around town (65%), hitting some scenic curvy roads (15%), going to a few car shows (10%), and doing a the occasional "for fun" track (5%) and autocross days (5%). I'm going for a vaguely vintage looking car with 15" billboards and the vintage gages. I have two boys that are 7 and 12. I'm really looking forward to working on this with them (and they are excited too). Since I have a family and many things going on, I'm planning on taking my time on this, so the build could be drawn out a little more than some of yours. It definitely won't be done in 9 months. -Swapped the pre cut dash for a blank dash. -3.55 gearing in the rear end along with a 31 spline axles and Ford Track Lok diff..
-Glove box. I like the way the glove box looks in the dash, so I'm going to try to get it to work with the heater. -Battery relocated to the front or under the trunk. 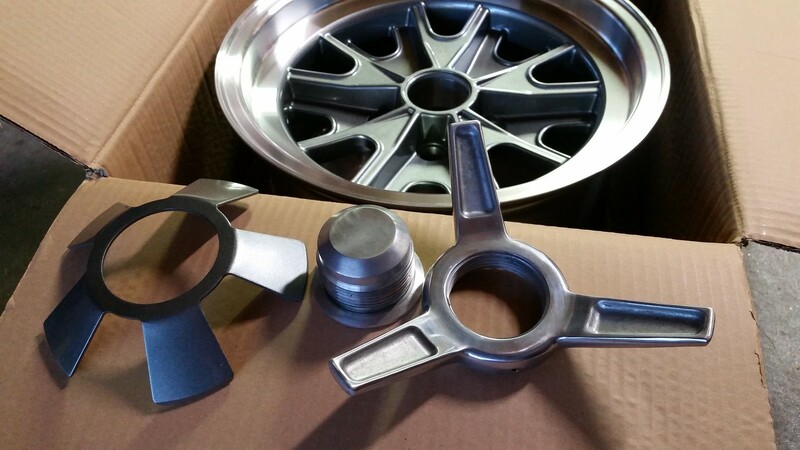 -A second set of 17" wheels and tires for running on the track. -Would really like to do rectangular taillights. -I'm planning to paint it Viking blue with white stripes and blacked out wheels, although my wife and kids are pushing for lime green and black stripes. I have a decent background of working on things, but I am no expert when it comes to building cars. Many of the steps will be new to me. I'm excited to learn some new skills. I'll be asking tons of questions along the way. Feel free to point out anything I've done wrong. I also hope to contribute something to the forum during this build, whether it's a new designed part that others can use, a nice CAD drawing, or simply helping someone else in their build by showing my pictures and sharing my experiences. 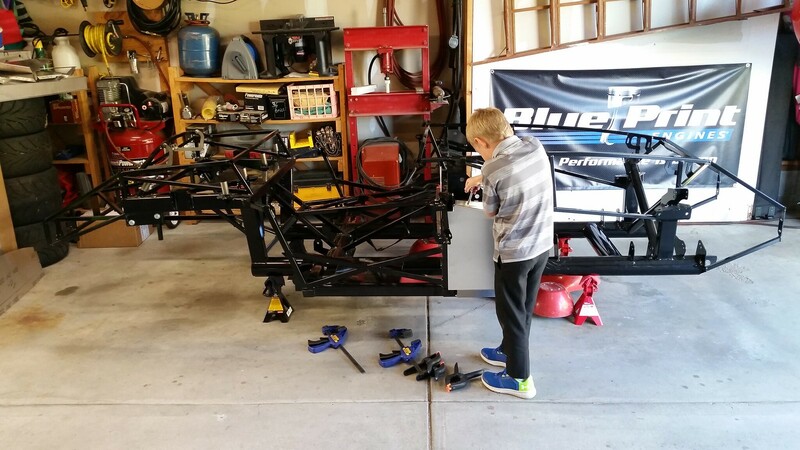 Post #96 - Tie Rod and Steering Shaft Installation. 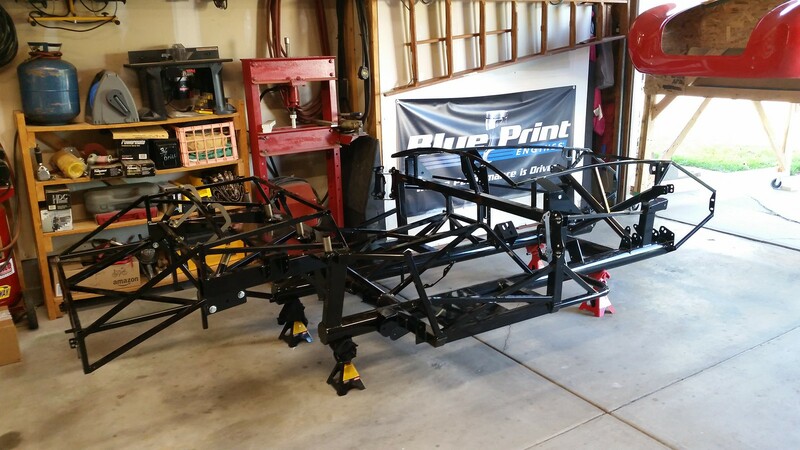 Post #186 - Axle Assembly Bolted to Frame & Rear shocks installed = Rolling Chassis!!! Last edited by Yama-Bro; 03-25-2019 at 10:52 AM. Helping Jerry unload. I had a crew of helpers. I had my Mom taking box inventory. My wife taking pictures, My Dad, brother and two sons moved boxes to the garage and my friend Jason and I lifted them from the back of the trailer. I'm the guy in the orange at the front of the car. A big THANK YOU to BPE...I wouldn't be doing this project so soon if it wasn't for the cool company that I work for. Last edited by Yama-Bro; 10-17-2018 at 09:17 AM. Congratulations! I am scheduled to pick up my kit at the factory on Sept. 16. I am excited to get started. thanks for doing the build thread and I will be watching your progress. Good luck!! Congratulations! 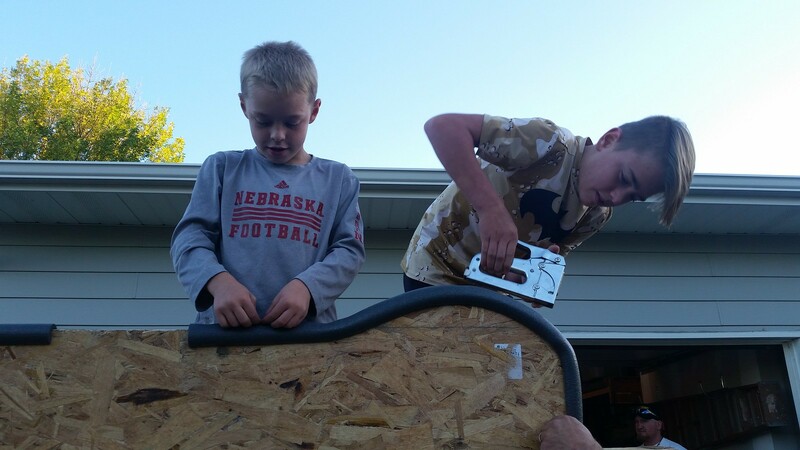 You are going to have a lot of fun building the car with those boys! I never made it to the BluePrint factory as my trip to Omaha didn't go as planned. My wife and I ended up leaving Denver at 6:30pm on a Thursday and we came back on a Sunday. I waved as we passed the bridge over I-80 each way. That sounds like a great build plan. Those boys are going to have a blast and will have memories that will last the rest of their lives. My kids are out of the house and didn't get an opportunity like you have. Enjoy it. They grow up fast. I see you live in Kearney. I lived in a little town north of your, Ravenna. Didn't live their long, about a year. I travel to that area of Nebraska a couple of times a year. Maybe I will see you driving around when I am in your neck of the woods. I am looking forward to following your build. I've been to Ravenna a few times. I know several people from there. My boys and I did inventory on the 3rd box tonight. 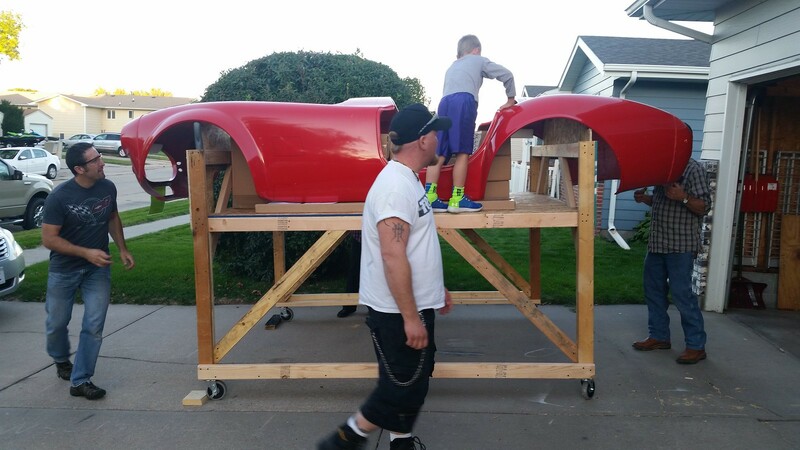 It probably took twice as long as it should have because every part we took out of the box had to be held up next to the car where it will go. Every time we did it my little guy's jaw would about hit the floor. LOL. It was pretty fun. I recieved more goodies in the mail tonight. 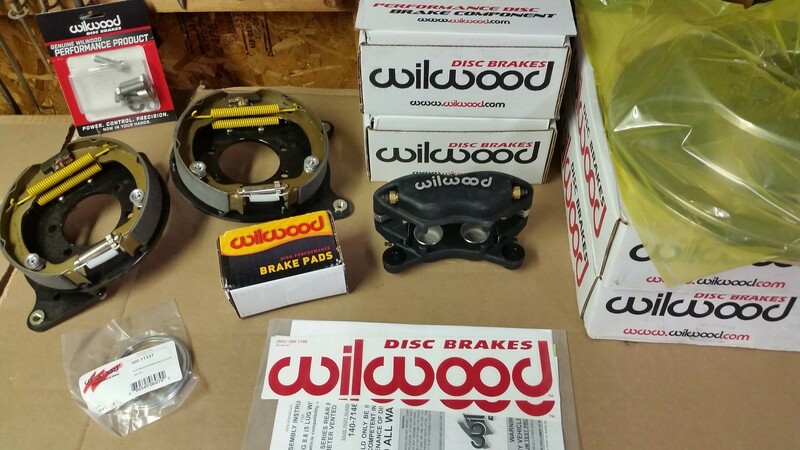 Gordon Levy Racing Wilwood front and rear brake kits for FFR 15" Halibrand replica rims. Very Nice! Thanks Gordon! Last edited by Yama-Bro; 10-17-2018 at 09:21 AM. haha, no, those are the emergency brakes. The discs are to the right, wrapped in yellow plastic. Not as obvious in the picture as the drum shoes. I haven't studied up on how it goes together yet, but I assume the shoes are inside the discs. Last edited by Yama-Bro; 09-06-2017 at 10:30 AM. Everything looks great. The boys looked pretty excited! You are going to have some pretty awesome memories to share with them! 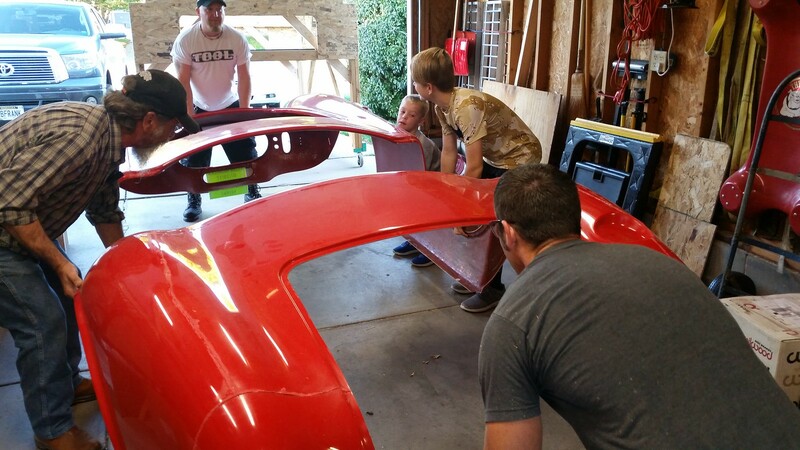 There has been nothing like the experience I have shared with my boys during the build! I wouldn't trade it for anything. Good luck as you get started on your build. I know what you mean regarding a slow build. I too am taking my time with my build. 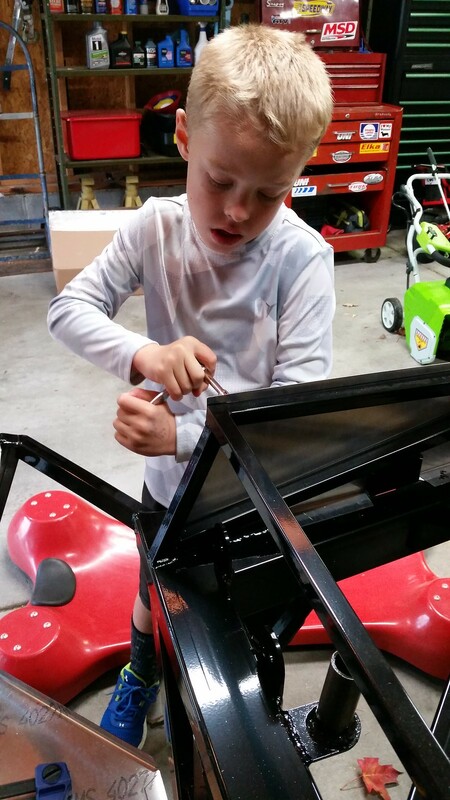 Partly because my boys aren't around much to help me like they were when I started. Regardless, it is all worth it. Watching it come together is very rewarding! Good luck selecting your power plant. BluePrint has many great choices, as you know. My 408 looks amazing, and I can't wait for first start! I look forward to following along on your build! Last edited by WIS89; 09-26-2017 at 08:36 AM. A Big Congratulations From The Big Easy! Congrats! Don't hesitate to ask when you have issues. Lots of great/knowledgeable people willing to support you. Thanks for the comments guys! I will definitely be using the forum for support. I have a mechanical background, but am by no means a pro at building cars. A lot of the tasks will be all new to me, so there will be lots of questions. To me one of the big selling points of FFr is the forum. Last edited by Yama-Bro; 09-08-2017 at 02:22 PM. To me one of the big selling points of FFr is the forum. 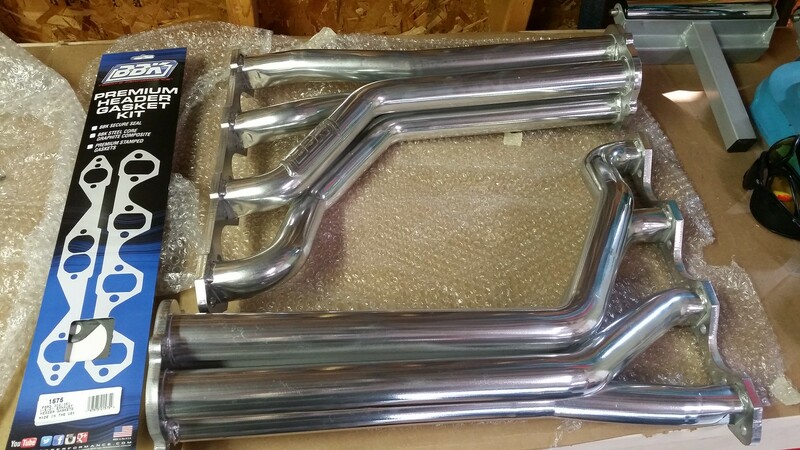 The headers. They are just pretty. The last part that got me excited was the basic wood steering wheel. I just like the way it feels. I like the slenderness of the wheel. I like the finger grips on the back side. 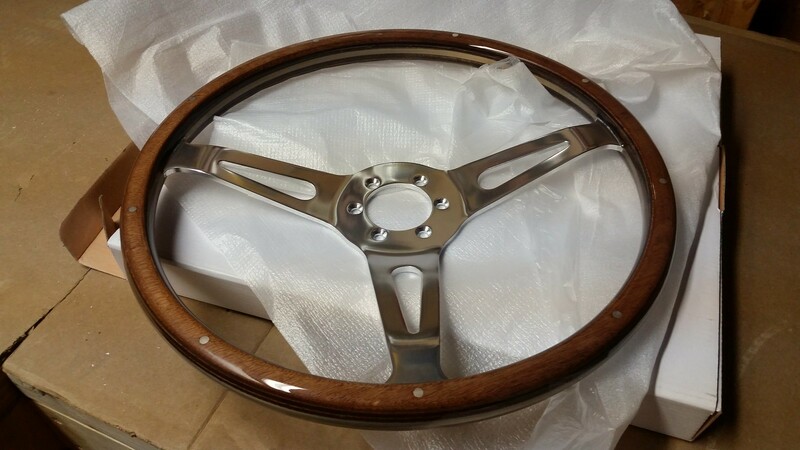 It reminds me of my Dad's 68 GTO steering wheel. Back in the days before the insides of our cars were completely wrapped in plastic. Well, time to stop drooling and get busy with a body buck. Last edited by Yama-Bro; 10-17-2018 at 09:59 AM. 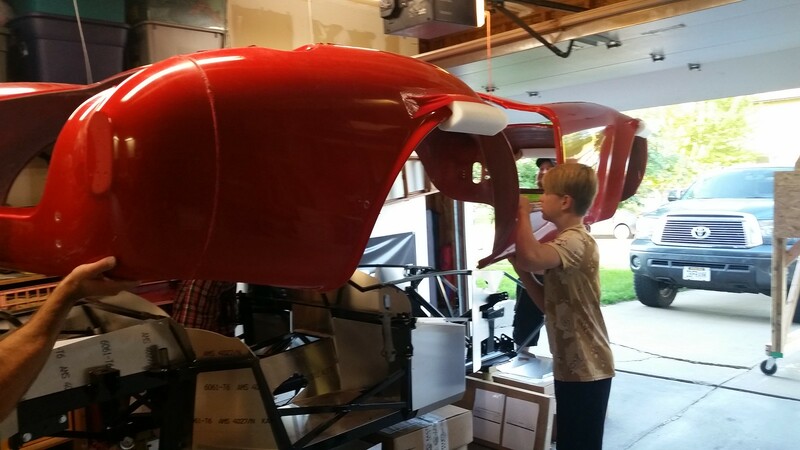 I am still excited when I look at the car coming together in my garage. I even have a few parts sitting in my office. 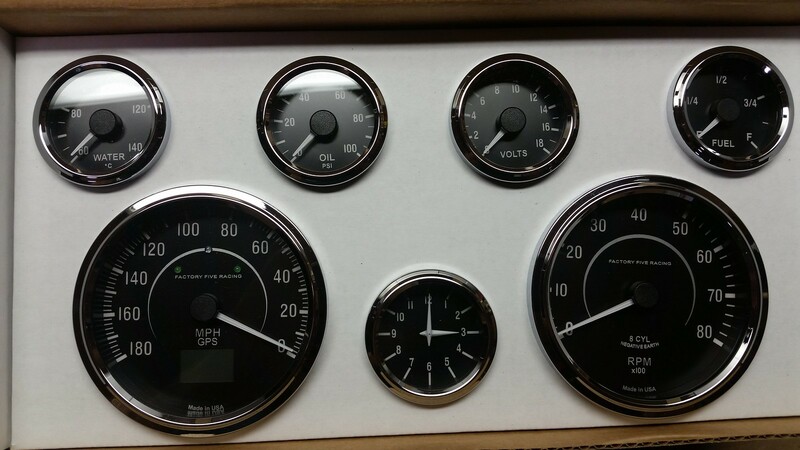 I have rotated in the gauges, steering wheel, Lemans cap, etc. They just look cool! My BluePrint engine looks amazing too of course! 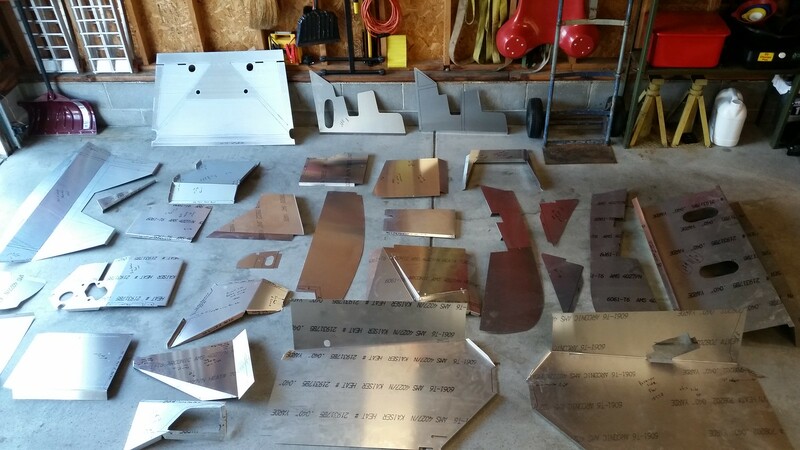 I even leave some of the cool looking parts laying out on my workbench, even though I don't need them yet, just so I can see a little bit of bling. Good luck as you get started. I look forward to following along. Awesome! I haven't put my steering wheel away yet either. I'm glad I'm not the only one that has the sickness. LOL. I haven't taken anything to my office yet, but that's a good idea. Hey Yama-Bro, you haven't posted for a while, how's the build going? I am watching you closely as we are almost related; My delivery was 9/15, my number is 9160, and I got a great deal from Pete on a Dart 427, even got him to put EFI on it for me! The rest of my set-up is very similar as well. Anyway, looking forward to watching your build. Hi BB767! 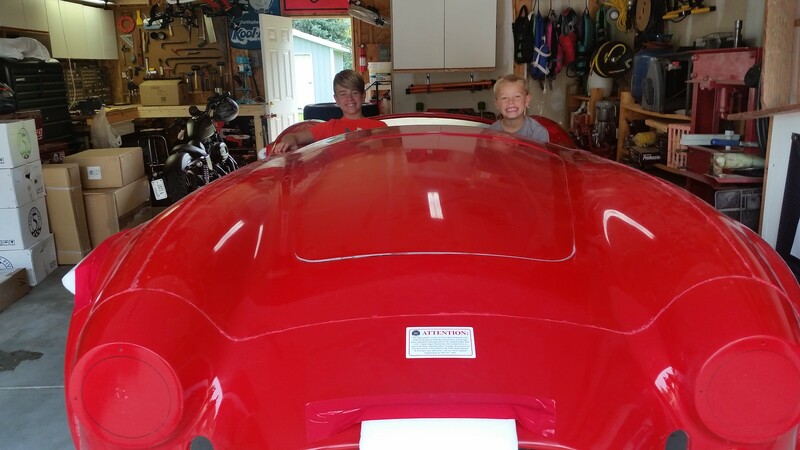 We are pretty close with our roadsters. Yours was probably right behind mine on the trailer. Are you doing a build thread? My build is moving along, just not real fast. 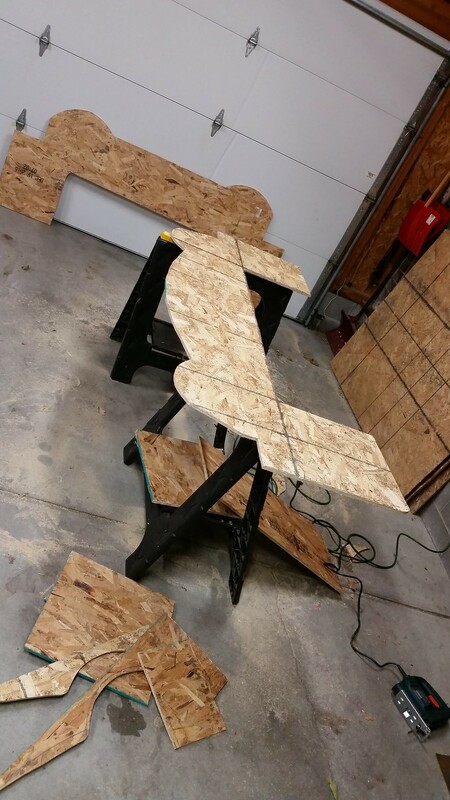 I'm working on the body buck right now. 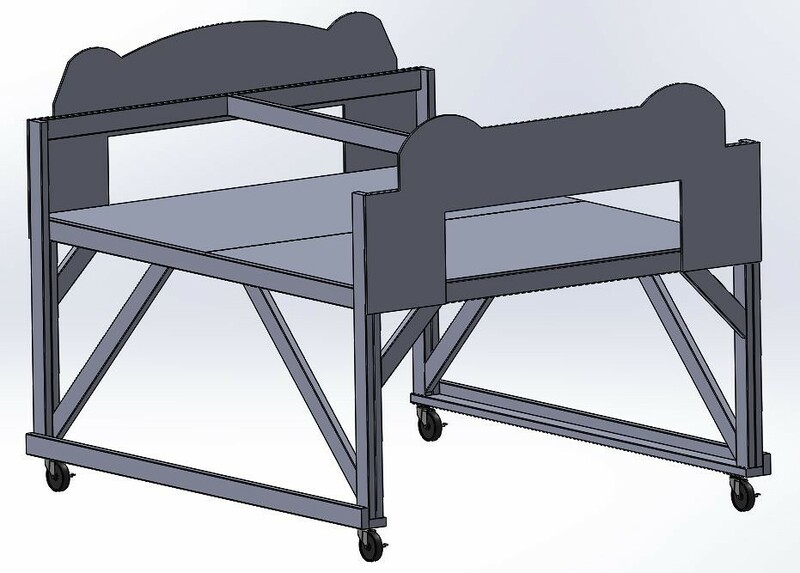 I ended up beefing up the design of the typical roll-over-frame buck so that I can store several of the kit boxes on the shelf and maximize my floor space. It has yet to be determined how much I can actually push once it's all loaded on the shelf, but I can adjust as needed once it's done. Last edited by Yama-Bro; 12-07-2017 at 09:23 AM. I think your buck frame will work well, as you know many of the boxes are not that heavy, the shelves will be a great place to put those. I have not started a thread, been to busy building! Have been following the build order in the book pretty much and am up to the fuel line install this evening. Keep going, it only gets better! 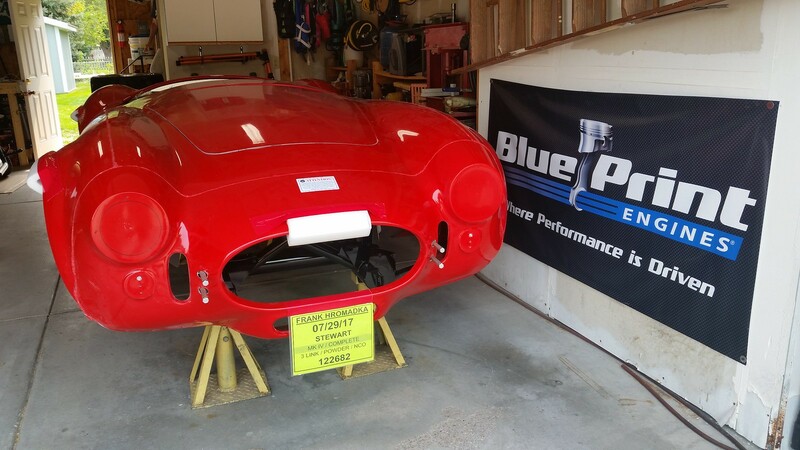 Can you disclose what you are working on at BluePrint or is it classified? You are way ahead of me, LOL. I'm excited to actually get started building the car. I can't say what I'm working on at BluePrint, but the project I'm working on is a big secret. So big that, I can't even discuss it with most of my fellow employees (even some of the other engineers). It's one of those projects that has a cool code name...always fun! I ended up using Flickr as my photo hosting site. I didn't like task of resizing each picture while hosting on this site. Flickr has that step a little more automated. Plus I think it does a better job at downsizing images and keeping them looking their best. The only downside I see to using Flickr is that some day they could do the same thing that Photobucket did and start charging for photo sharing. Last edited by Yama-Bro; 10-06-2017 at 12:59 PM. Nice! You get to work on cool engines at work and work on a cool car at home! Doesn't get much better than that! Keep us posted when the project is revealed. Not gonna mess with the photo thing, rather be out in the shop. 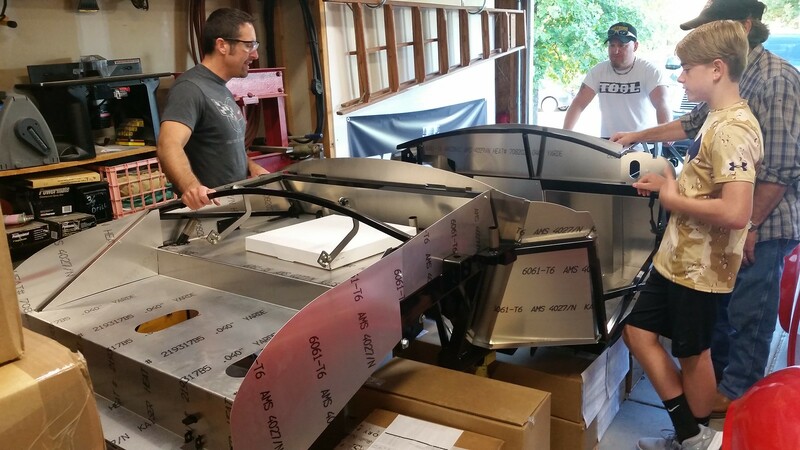 Your excitement will be rewarded, it is satisying to see when your creation starts coming together in your own shop. 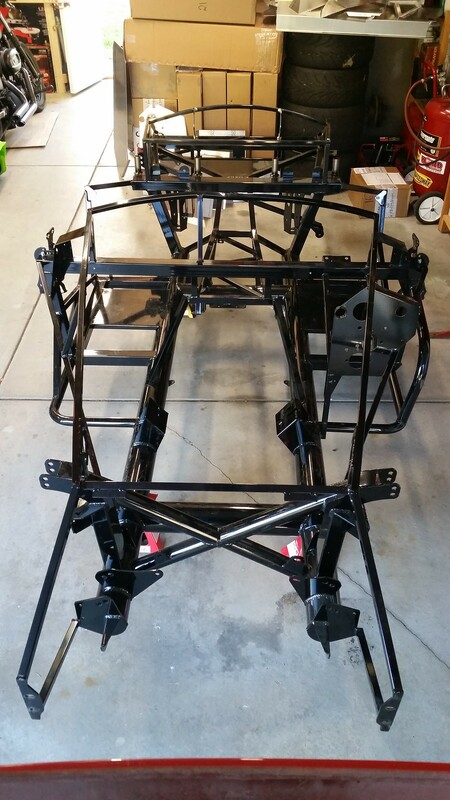 Whoo Hoo!, We got the body off this weekend. The really fun stuff is within reach. LOL. Cutting the contoured sheets for the body buck. I nested the front and back pieces onto one sheet of OSB like the manual shows. I used the newer layout for the rear of the MK4. It fit the curves like a glove. I thought the body was easy to remove, especially with this many helpers. Last edited by Yama-Bro; 10-17-2018 at 10:07 AM. Inspecting the frame afterwards. We did find some damage to the very top of the dash hoop that was hidden under the body. I'm not sure if it's a big enough problem to mention it to FFR. My Dad has a porta power that may be able to bend it back to shape. You can see the waviness at the very top of the dash tube in the picture. The boys attaching the pipe insulation for body cushioning. I decided to try stapling instead of the wire tie method. It worked great, was easy, and cheap. 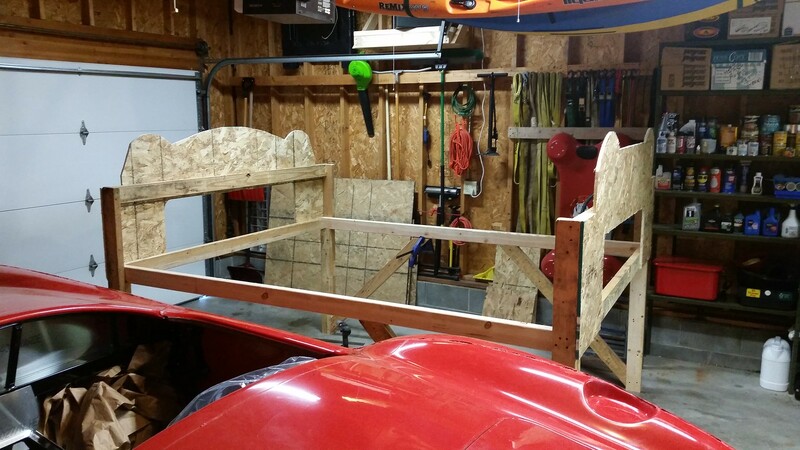 We'll see how it holds up over the life of the project. Body on the buck. I got a lot of the boxes on the shelf. 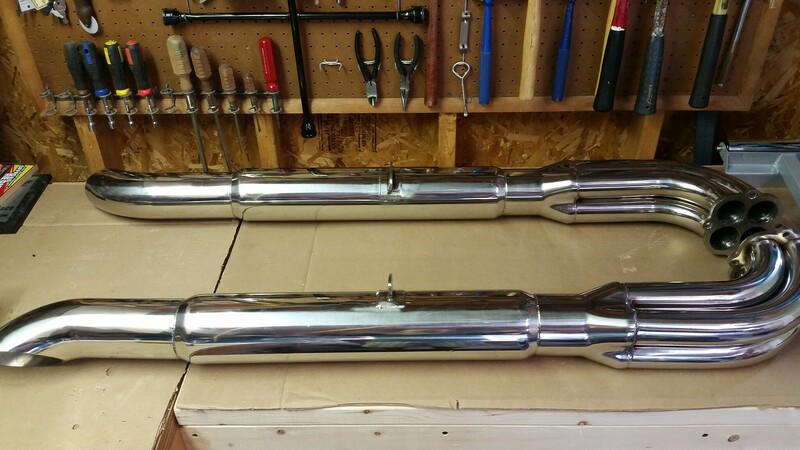 I left off the really heavy ones and the ones that I will be using soon (like the front and rear suspension). It's not to heavy for me to push myself, however I do need the help of another person to steer the opposite end. I used four swiveling casters. It may have been better with two stationary caster on one end. Last edited by Yama-Bro; 10-17-2018 at 10:11 AM. Looks like you have lots of help! That's great. Regarding the bend in the dash hoop. Strange. With no damage to the body it must have left the factory that way. But if the bend is vertical (top to bottom) it doesn't matter and will be completely hidden by the instrument panel and body. You could leave it as is IMO. If it's horizontal, e.g. the dash won't lay flat against it, then yes it should be straightened. Shouldn't be hard to do. That's pretty thin material. Looks like a whole lot of smiles in that garage! 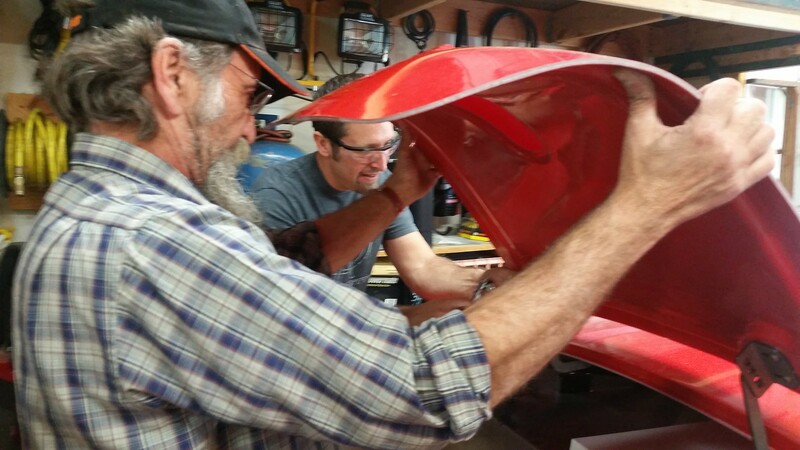 It's very cool that your Dad and your boys are there to help. Nice work on the buck; you will be able to pass it along to someone else when done, if you choose. I look forward to following along. It feels great, doesn't it? I would have to say the same I was sort of dreading the inventory, but like you found it way cool. While it took a fair number of hours it was of the wow I have been going through that set of boxes for 4 hours feels like I have only been out here in the garage for like 30 minutes. In the end I felt I have a much better understanding of the car its parts and how it goes together. I am a hands on sort of learner so no amount of reading moved my brain along as much as finally having my hands on the parts. I found myself a few times reading through the manual with the parts laid out on a table experiencing that ah-ha moment. I echo Paul's comments RE: dash hoop. Regarding the bend in the dash hoop. Strange. With no damage to the body it must have left the factory that way. But if the bend is vertical (top to bottom) it doesn't matter and will be completely hidden by the instrument panel and body. You could leave it as is IMO. If it's horizontal, e.g. the dash won't lay flat against it, then yes it should be straightened. Shouldn't be hard to do. That's pretty thin material. Paul and Jeff, thanks for the input! It appears to be bent mostly downwards, but the tube may have twisted slightly and intruded into the space that the dash would take up, so I may have to bend it slightly so that the dash will sit flat. I'll try to get a picture of it tonight, but I'll plan on bending it. Yep, my feelings exactly. 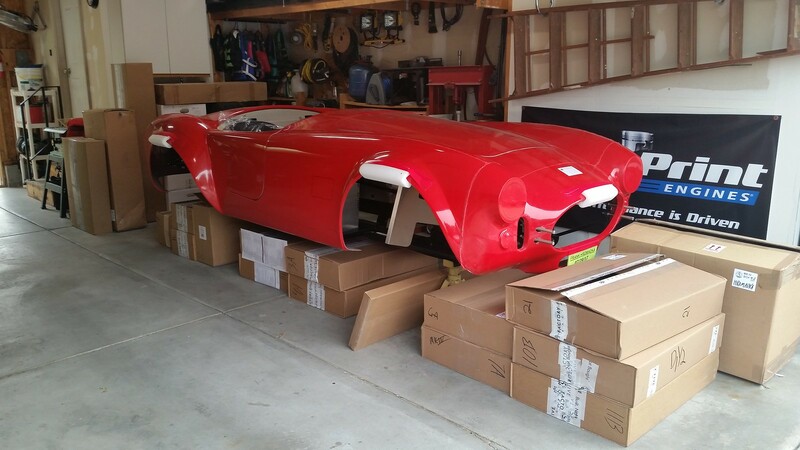 There's just so much to these cars that looking at pictures and reading posts doesn't really make complete sense until you actually see the parts in front of your eyes and have the parts in your hands. Here's a picture looking down at the bent dash hoop tube. 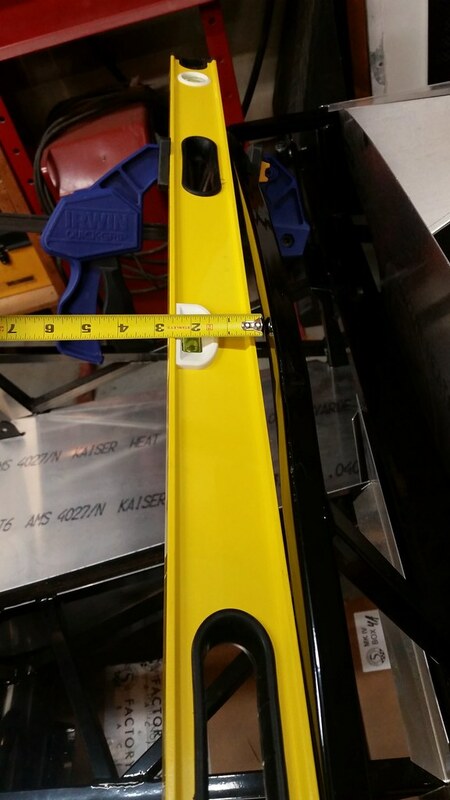 It is bent forward (away from the dash) and down about .25" in both directions. It definitely looks like something was dropped or sat on it. I guess the good news is it won't interfere with the dash, but is it to big of a gap to cause other problems, if I don't bend it back into place? Last edited by Yama-Bro; 10-17-2018 at 10:14 AM. I think I'd want it flat since whatever inward/outward curve it has will translate to the dash. One option would be to shim the dash and not try to bend the hoop. In any case, I'd call FFR. If it were bent during transport, I would expect to see damage on the body as well, so it likely left FFR's facility that way. At the very least thay may offer some compensation to make it right. I would definitely call FF and show them what you received. Don't know what they might be able to do, but at the very least they should know about it. That's not acceptable. Shouldn't be too hard to straighten. Doesn't haven't be perfect. But no point in trying to work around that much of a curve when mounting your dash. Hi Guys, Just wanted to give an update on the dash hoop bend. I called FFR and explained what I found. They had me send pictures. They called back about 1/2 an hour later and explained that it's not a critical area and that the dash won't be screwed down at that point. They said I could leave it as is or try to bend it back, but in the end it will be covered and won't affect anything else. They suspected the damage was done during shipping and that something in the trailer must have deflected the body and bent the tube. I was cool with trying to fix it myself, so I was good with that explanation. Dan G ended up doing a lot more that I expected and offered me a parts credit. 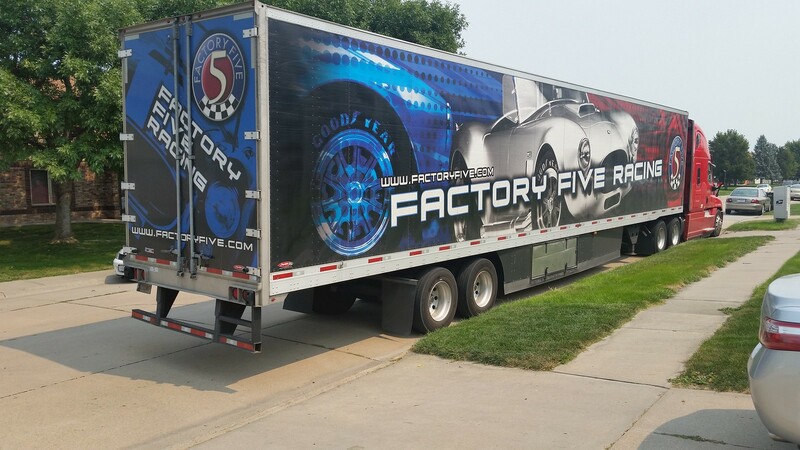 Factory Five has some great customer service! I'm impressed and happy! Bummer on the bent hoop. 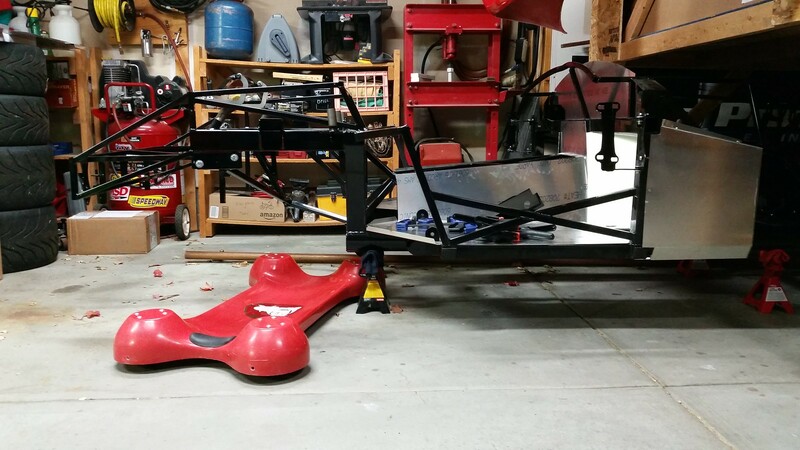 I have my chassis stripped and in a similar state right now in my garage. Do you want any pictures, perhaps with a similar straight edge aligned, or anything? I can get shots tonight and send them to you if you're interested. Roadster #9146. 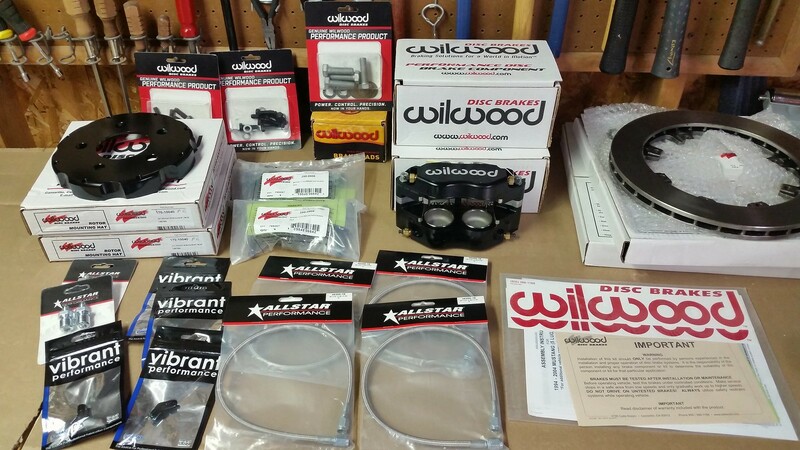 Complete Kit, 363W, Jim Inglese Weber Carbs, Forte TKO600 w/Hydraulic Clutch, IRS, Wilwood Brakes, F & R Sway Bars, 17" Halibrands, Power Steering, Breeze Front Battery Kit, Herb's Door Panels, and who knows what else left to be added. Ordered 5/19/17. Delivered 8/18/17. Slowly Building. Hi Mach'er, Thanks for the offer on the measurements or pictures, but I think I can get it back to where it needs to be with what I have. If I change my mind, I'll let you know. We removed the aluminum panels this weekend. 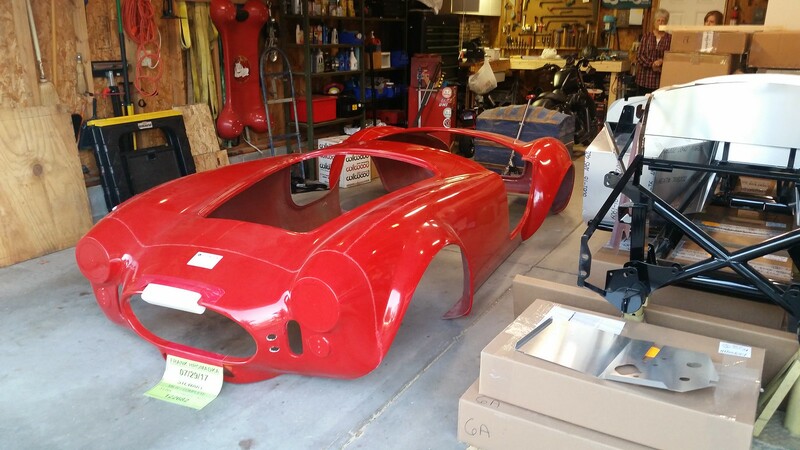 We started with the three back-of-the-cockpit pieces, then moved to the trunk, the driver's side floor pan, the driver's side foot box, and finally the passenger side foot box. I took a ton of pictures and used a black sharpie to label and mark all overlapping panels and frame tubes. On several panels I noted which direction is up, front of car and out (or engine bay). I also wrote the description of the panel and the part number (as found in the manual) for future reference. It seems pretty easy when the panels just come off the frame, but I figured I'll need all the help I can get to remember where and how they go together when it comes time to reassemble. On to the passenger side. 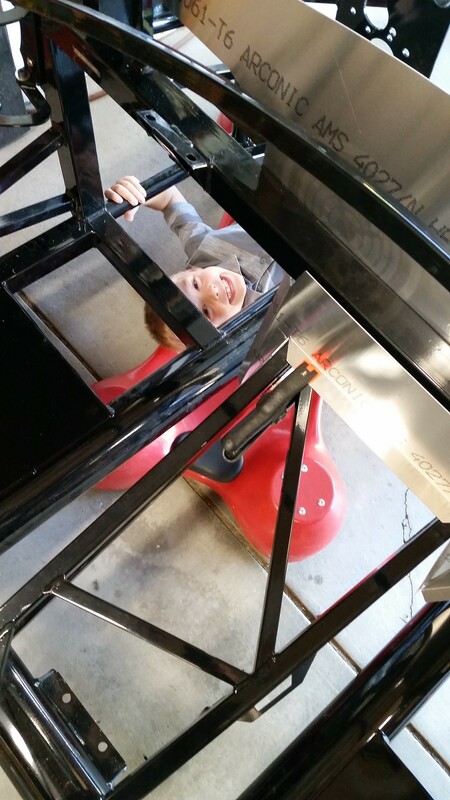 My son really took to taking off the panels. We had a lot of fun. Last edited by Yama-Bro; 10-17-2018 at 10:20 AM. Your kids are going to be the biggest motorheads in your town when this is all over. Congratulations On Officially Joining The Family!